The 2.6m x 3.3m 19mm Log Cabin offers a large outdoor living space that can be used as a multi-purpose area for the whole family to enjoy. With large double doors and two windows, enjoy the views out to your garden from the comfort of this fantastic log cabin. 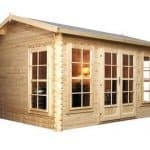 This 2.6 m x 3.3 m log cabin has one distinguishing feature that makes it a very good buy. The logs that make up the building are 19 mm thick and therefore tough enough to withstand both daily wear and tear and the elements. This is a key feature because it has a direct impact on how long the structure will last. Aesthetically, it is a fine-looking building, with two styrene windows that open and let in plenty of light. You also have plenty of space inside, and a lockable door so that the items and furniture inside are safe. Comes with a 10-year anti-rot guarantee. Additional roof shingle options in red, blue and green are available at an extra cost. The overlapping shingles protect the log cabin from the elements and providing a strength and longevity for the building as a whole. A log cabin offers much more than just another garden building or shed. It is a space in which you and your family and friends can spend time relaxing, pursuing hobbies or simply enjoying the view to the garden. It is important that your choice of log cabin fits your particular requirements and the way in which you live your life out in the garden. In this section we have a more detailed look at what the 19mm log cabin has to offer and the features that it provides. Exterior: The cabin is constructed from 19mm logs that combine traditional and contemporary styling. 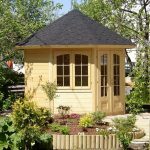 With a light timber exterior, this log cabin will look right at home in any style of garden. The strong wood and roofing is completely weatherproof and will protect the interior from the elements all year round. Interior: The spacious interior area measures at 2.6m x 3.3m, providing a fantastic additional living space to your property. The interior is a blank canvas in which you may create your dream relaxation, dining or hobby room. With enough space for furniture and all your home comforts, this is a great space for everyone to enjoy. Windows: With two tall windows, one to the front and one to the side of the building, the cabin interior is filled with light and ensures great views out to the garden. Doors: The large double doors are three quarters glazed and provide wonderful views out to the garden whether opened or closed. Security: The double doors come complete with a secure lock and key to ensure that your items are kept safe whilst not in use. Due to the large windows, there may be an issue with visibility and security, but not high enough that we can see it being a major risk. 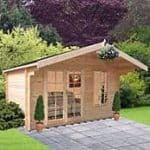 2.6m x 3.3m 19mm Log Cabin: How easy to build? The manufacturers of this log cabin ensure that assembly is as straight-forward and easy as possible for their customers. 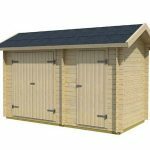 The product will arrive directly to your door in a flat-packed box with all of the timber panels, roofing, glazing, fixtures and fittings required for assembly. It is recommended, due to the size and weight of the timber panels, that two people undertake the assembly process together; this will also make the process faster and more efficient. A complete set of instructions will be provided and we expect, with a basic knowledge of DIY, this particular model could be built within a day. A home installation service is also available at an extra cost. 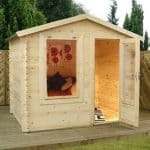 2.6m x 3.3m 19mm Log Cabin: What is the overall quality like? This particular log cabin is built from 19mm timber logs to give the building an attractive and protective exterior. Constructed from Baltic sourced pine, the wood is both denser and longer lasting than more regularly used timber, meaning that it is of a superior quality. It is recommended that although the log cabin comes complete with a floor, the building should be placed on a level base in order to create a sturdy foundation. Styrene glazing is used for the two windows and three-quarter glazed double doors. A shingle roof may be purchased as an optional extra with a choice of colours available. A shingle roof provides an extra layer of protection for the log cabin against both water damage and the elements. The 19mm Log Cabin has a fantastic 2.6m x 3.3m interior space in which you can use as an extra living area to enjoy with family and friends. 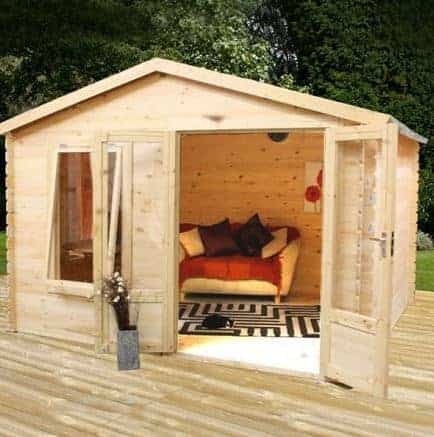 With the ability to fit a few pieces of full sized furniture, you may use the log cabin to its full potential, either as an outdoor dining space, relaxation area or hobby room. This log cabin befits its higher price tag due to both its superior quality and size.